Tycoon Tann is serving up new nourishing seasonal winter menu and clay pot delicacies to warm your hearts this autumn and winter from now to 4 February 2019. In addition, Tycoon Tann is offering sumptuous festive dining experience and specially crafted menus for guests to indulge in this festive season including an mouth-watering 8-course Winter Solstice Menu, Festive Brunch and an 8-course Christmas & New Year Menu to make the festive season more memorable. “Winter is approaching and it is the best season to strengthen our body according to Chinese medicine concepts. We have specifically crafted a new nourishing seasonal menu for health benefits together with claypot delicacies to keep you warm in the cold season. This year, Tycoon Tann has also newly launched the Deep-fried Crab with Dried Chili, Garlic and Rice Flour Rolls, a perfect dish to whet the palate and sharing with family and friends for a hot festive celebration,” says Cherry Lo,Executive Director of bma Catering Management. Soup is surely the perfect dish in the winter menu to keep you nourish in cold days. A highlight of the menu is the Double-boiled Silkie Chicken Soup with Fresh Ginseng (HKD268). Boiled for six hours with fresh ginseng from Korea, fresh pork meat and preserved ham, the silkie chicken have been well-known ingredients in Chinese culture for soups, for the belief that it moisturises the body, fortifies the kidney and liver. This soup will get guests ready for winter and the festive season. Fried Egg White with Fresh Crab Meat and Black Truffle (HKD328), a delicate seasonal dish definitely satisfy for those looking for a taste of elegance! The succulent crab meat is hand-picked slices to slices and perfectly balanced with the creamy egg white of organic eggs, while adorned with shavings of Italian black truffle. Also known as “Black Diamonds”, the Italian black truffles are even more intense in flavor and aroma in winter than in summer. 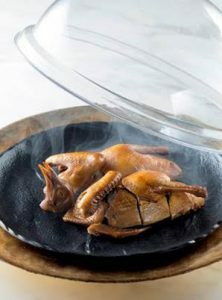 In addition, the Smoked Pigeon with 30 Years Aged Puer Tea (HKD 198) is first braised with homemade marinated brine sauce, then smoked with 30 years aged puer, crafting the dish to perfection. The chef also combines seasonal ingredients to create an appetizing dish. 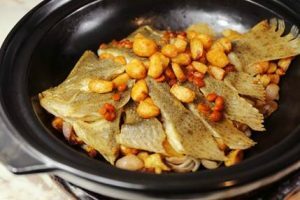 Not to miss Baked Turbot Fish with Garlic, Ginger and Dried Shallot in Casserole (HK$468), The fish is tender and sweet with scallions and fried garlic that encompass the flavours. Lamb is a well-known traditional dish in Chinese cuisine in the cold season. It is hot in nature, dispel colds and nourish energy and blood. 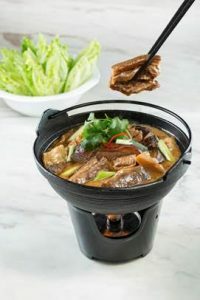 Tycoon Tann has especially used Dongshan Mutton from Dongshan Mountain, is one of the most 4 famous dishes in Hainan, for its newly launched Braised Lamb Brisket with Bean Curd Sheets in Clay Pot (HKD888). Renowned for its tenderness and free of mutton smell, Tycoon Tann selected only the fresh mutton brisket and braised for 3 hours for the perfect flavours and texture together with bean curd sheets, preserved bean curd, preserved red bean curd and homemade Chu Hou sauce. Lamb invigorates “Yang” in Chinese medicine theory like adding you extra clothes to keep you warm, especially fortifies kidney to benefit the “Qi” and warm blood circulation as well as moisturising and with skin-beautifying functions. Winter is also the best time to savour the warming delicious claypot rice. The warming Claypot Rice in Casserole with Preserved Meat and Chinese Sausage (HKD328) with quality preserved Chinese sausages, preserved pork and preserved duck are giving the amazing aromatic flavours, will certainly delight and charm this winter. 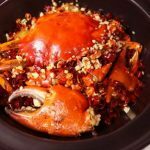 Autumn and winter is best known to Hong Kong’s culinary connoisseurs as crab season, which is also the highlight of this festive season. The Deep-fried Crab with Dried Chilli, Garlic and Rice Flour Rolls (HKD698) is a perfect dish to whet the palate and sharing with family and friends for a hot festive celebration. This exciting dish comprises of spicy red cluster pepper and with rice flour rolls beneath that perfectly absorbed the alluring flavours of the crab and spiciness, giving a true indulgence of the night. Tycoon Tann will kick-off the winter season on 7 to 22 December with an indulgent Winter Solstice 8-course Menu (HKD 3,688 for 4 persons), featuring traditional Chinese dishes of winter flavours such as Double-boiled Bamboo Chicken Soup with Fresh Ginseng, Steamed Melon Seed Garoupa with Soya Sauce, Braised Pea Shoots with Shredded Abalone, Fish Maw and Sea Cucumber and Tycoon Tann Crispy Chicken with Black Truffles as well as the restaurant signature Steamed Rice with Charcoal-Grilled Hungarian Mangalica Hogs with Honey Sauce and Pan-fried Egg. Tycoon Tann uses Hungarian Mangalica hogs for a premium twist to this quintessential Hong Kong dish, resulting in incredibly moist and tender meat with well-balanced fat, while it melts in the mouth and crispy on the outside with a slow grill over charcoal and perfectly goes well with steamed rice and pan-friend sunny egg. The Festive Brunch (HKD538 per person) is available on 24 to 26, 31 December and 1 January for relaxation and unwinding. The sumptuous festive brunch featuring Tycoon Tann favourite dishes including an unlimited selection of dim sum, appetizers, soups, rice, noodles, signature dishes and dessert. Guests can also enjoy free-flow of cocktails and wines with an additional of HKD140, and G.H. Mumm champagne with an additional of HKD200 for a blissful festive season. The Christmas and New Year 8-course Menu available on 23 December to 1 January is the ultimate celebration and priced HKD888 up per person (for minimum two persons). Start with the Tycoon Tann the Festive Appertizers Platter including Red Jelly Fish Tossed with Wasabi, Smoked Poached Egg with Caviar as well as Chilled Greenhouse Cucumber with Japanese Black Garlic and Garlic Sauce to heighten your Christmas mood. Savour our range of signature dishes such as Fried Egg White with Fresh Crab Meat and Black Truffle, Slow-Roasted US Angus Beef Short Rib with Honey Sauce, Steamed Rice with Charcoal-Grilled Hungarian Mangalic Hogs with Honey Sauce and Pan-fried Egg and Tycoon Tann Signature Roasted Peking Duck. Guests can enjoy the Sweetened Dumpling with Egg White Almond Cream and Chilled Black Sesame Roll as a perfect finale of the festive season. Guests who want to extend the festivities will enjoy a pre or post-dinner drink in Mod Bar, which has released two new Christmas cocktails perfect for celebrations. The Chocotini is a rich cocktail of rum, Khalua, baileys, fresh cream, chocolate syrup, chocolate powder, cracker and marshmallow. For sweet cocktail lovers, the Merry Me is a combination of vodka, blue curacao, Malibu rum, fresh cream, pineapple juice and garnished by coconut flakes. This snowy blue cocktail brings this joyful season to life is the perfect finale to the satisfying festive dining experience. Throughout the festive season, Tycoon Tann is available to hire for private parties or events and festive gatherings with family, colleagues and friends celebrating festive season and new year. Guests may opt for a 40-people cocktail party at Mod Bar priced from HKD4,000 to HKD8,000 or intimate dining in the restaurant that seats 28 people each floor, taking up the complete first or second floor priced at HKD8,000 to HKD20,000. For further details, please contact 3125 3228. The Tycoon Tann team wish all a very warm Winter Solstice, Merry Christmas and Happy New Year! All prices listed above are subject to a 10% service charge.